Access our open source projects on Bitbucket and GitHub! Good news everyone! We're happy to announce that all our open source projects are now available not only in Mercurial, but in Git too on GitHub! Sync Git and Mercurial repositories with Git-hg Mirror! If you're using a distributed version control system in your software development team (and you really should!) then most possibly you go with Git or Mercurial. But what if you'd really like to use a repository in your project that is on the other system? Now you can use Git-hg Mirror: it's a super-simple service that automatically keeps a Git and Mercurial (or two Mercurial) repos in sync, even with two-way syncing! Commits pushed to one repo will just magically appear in the other repo. What a time to be alive! The website is (obviously) built on Orchard - you can see our demo on the last Orchard Steering Committee meeting. 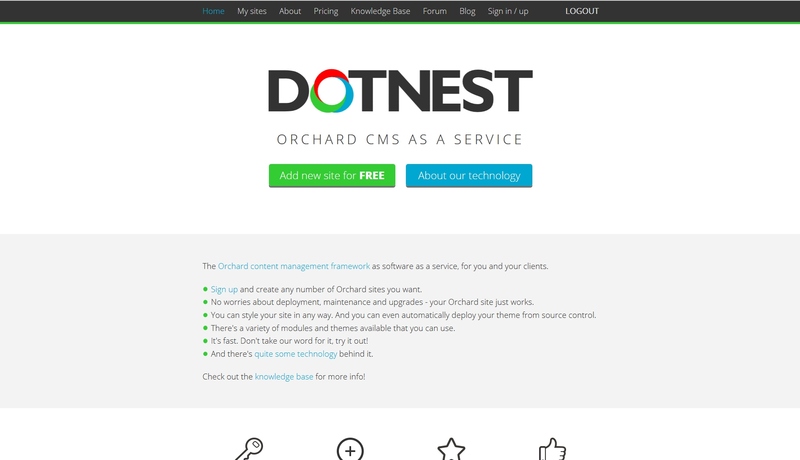 Our Orchard CMS SaaS DotNest got a new look and feel! The old theme was a bit clunky, but now it looks as it should. Check out DotNest where you can create Orchard sites for free, without having to think about hosting!